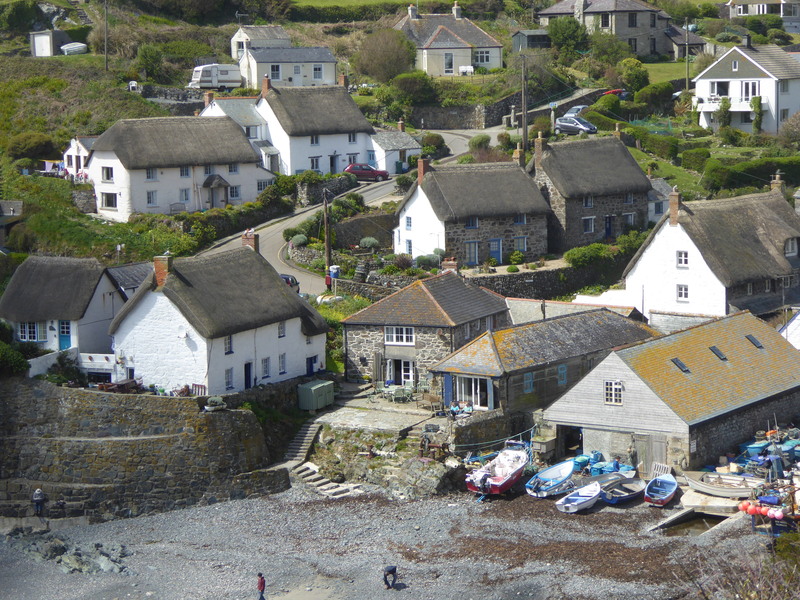 Cadgwith is some 70 miles south south west of Steeple Point. If you walked the coast from Steeple Point to here, you would have walked approximately 240 miles. 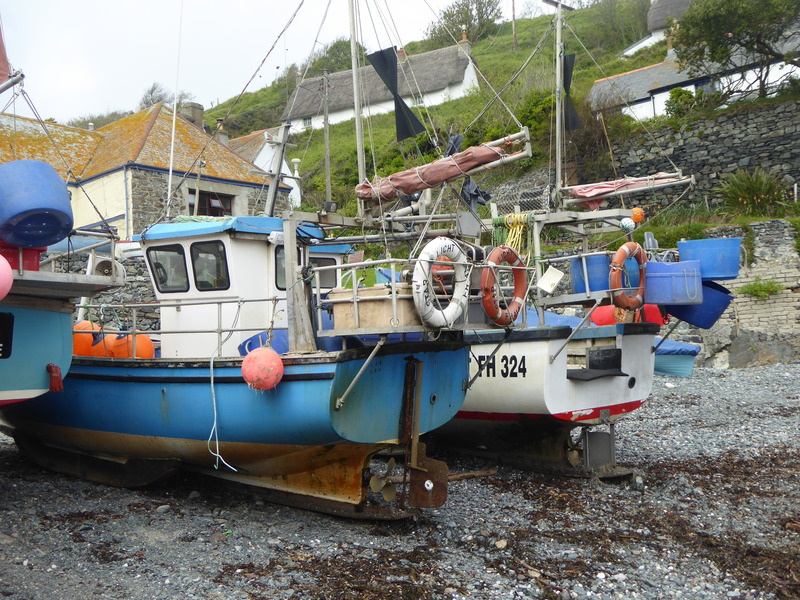 We walked into Cadgwith from Kennack Sands just to the north – a mere two and a half miles on a Saturday morning with a wind blowing and clouds scudding. I like Cadgwith a lot. The walk to it is spectacular and the first views breath-taking, but, like many places in Cornwall (and nearly every ‘tourist destination’ I have ever visited), I have a reservation about the difference between the glossy presentation and what I am actually seeing. The village is lovely, full of thatched cottages guaranteed to please every idle visitor and a good pub with great crab sandwiches . . . but for me the boats tell the real story. There has been a recent storm and they are hauled well up the beach. The lines of seaweed show the reach of the sea. I photographed these boats because I like their function, their form and their colours, and the juxtaposition of natural environment and human intervention that they provide. But these images give, if not a glossy, at the very least a satin view of the Cornwall I was born into. I want to keep taking photographs but I am uncomfortable about creating a ‘satinised’ view and would like to give the images more context. 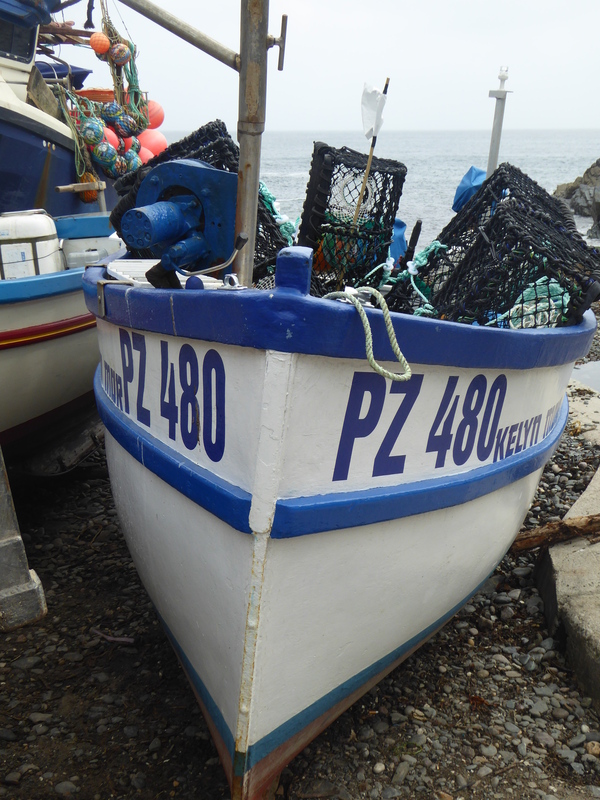 These boats are more than pretty pictures, they are livelihoods. They represent real people; their families, their generations, their births and deaths; they represent their knowledge, skills and attitudes; they represent their hard work through short seasons; they represent their hope, their excitement, their good days and their bad days. They represent small businesses in tight financial times. They represent the substance of the area – the local people – people who – (and this is my true concern), get gradually overlooked by a thriving tourist industry, placed second to extraordinary local history and beautiful land and seascapes. Local people are far more important than the glossy images painted for visitors. If the tourist industry is vital – (and it certainly is in Cornwall), surely it works because there are local people whose livelihoods lie outside that industry, people who grew up with the sea and the land, people who provide the underlying vitality to the area. If the whole county turns in on itself to provide lovely views, exciting distractions, pasties and cream teas, then it will lose the vitality it is attempting to sell and become a theme park. Is it important to attract businesses to Cornwall from outside the tourist industry, businesses that attract Cornish men and women as well as newcomers? – Absolutely. I am sure there are those who are working on this. I want to give them encouragement by adding another voice to the cause, and also to remind the tourist industry that the value of Cornwall lies in its people. From them all Cornish values rise. ← Shakedown sail – in the way, bodies learn then need to relearn.